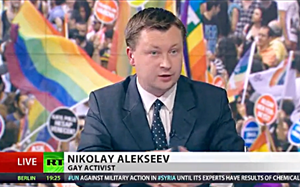 A court in Kostroma, Russia this week awarded embattled, longtime gay activist Nikolai Alexeyev a whopping 3000 roubles ($56.09) in ‘moral damages’ after a Pride event he organized was forcibly cancelled. The same court ordered authorities to pay Mr Alexeyev over 8000 roubles ($115.13) in October as pecuniary damages and legal fees – bringing the grand total to just $171.22 that comes no where near recovering the costs of the event and the attorney fees. “It is a label attached to the Russian Federation by other countries, especially by those which have criminal responsibility for people of non-traditional sexual orientation.